The beautiful McLean Foyer of Meditation in the Armstrong Browning Library is a popular and elegant setting for weddings. We wish to assist you in making your very special event as lovely as its physical surroundings. In return, we ask that you help us protect the building's facilities and treasures. Please read carefully. It is the responsibility of the signatory of the Wedding Application Form (usually the bride-elect) to ensure that the wedding party abides by these policies. Baylor is a private Christian University affiliated with the Baptist General Convention of Texas. Therefore, in keeping with biblical principles and Baylor policy, a wedding at Baylor must be between a man and a woman. *This designation requires a donation of $10,000 or more. Contact John Bales, Library Development, to make a Library Patron donation. Request a Wedding Application Form in person, by telephone, or by e-mail. Return the Wedding Application Form within 10 days from date received and pay the Wedding Fee ($2,000.00) and Security Deposit ($500.00) in full ($2,500.00). After your date has been confirmed, schedule a meeting and walk-through with Ms. Ross or a designated library representative to discuss the possibilities and limitations of the facilities. Special Note. Two weeks prior to the wedding, the bride-elect and/or the wedding consultant must call or see Ms. Ross or the designated representative to discuss all aspects of final preparations. After this time, extensive and time-consuming changes will not be considered. Wedding receptions are not held in the Armstrong Browning Library at any time. Only one wedding is scheduled during any month and only on a Saturday afternoon no earlier than 2:00 p.m. and no later than 4:00 p.m.
Should there be several requests for the same month, preference will be given to the first application received with fees paid in full. Rehearsals and weddings will not be scheduled on University holidays or on any day when the University is officially closed. Seating capacity for the McLean Foyer of Meditation is 200 people: 140 chairs maximum (depending on setup) with 60 persons seated on cushioned benches. The Foyer cannot accommodate 200 chairs. Wedding Fee: $2,000.00, for five (5) hours total building access, including the rehearsal and preparation time. We accept check or cash, no credit/debit cards at this time. This fee covers rental of the space, ABL staffing fee, security service, chair rental and set up of chairs, and set up and use of audio system, if needed. Security Deposit: $500.00 (refundable). A fee of $100.00 will be deducted from the deposit for each hour (or portion thereof) that the rehearsal or the wedding exceeds the allotted time. Damage to the Library will result in forfeiture of the security deposit. Damage includes (but is not limited to) stains, scratches, and trash. Deductions will also be made when rules have been violated (for example, proof of food and/or drink in unauthorized locations). Deductions are made at the discretion of the Library Director. Cancellation: Only the security deposit will be refunded. Please make checks payable to the ABL Guardian Angel Fund in the amount of $2,500.00. The bride and groom receive complementary three-year memberships in the ABL Guardian Angels organization (the Library's friends' group). The wedding fee pays for a total of five (5) hours for rehearsal and wedding. Note: Wedding photographs must be completed within this five-hour period. Rehearsals are scheduled no earlier than 5:00 pm and no later than 6:00 pm on the Friday evening prior to the wedding. The building will not be opened prior to a time agreed-upon in advance. The wedding is allotted 3.5-4 hours (depending on amount of time used for the rehearsal), including arrival, pre-wedding activities, the ceremony, photographs, and departure. No lighted candles, including unity candles, are permitted in the Library by order of the Fire Marshal. Smoking and alcoholic beverages are not permitted in the building or on the grounds. Food and soft drinks for the wedding party prior to the ceremony are permitted only in the Cox Reception Hall and the kitchen on the first floor. Birdseed must be used rather than rice. It should be distributed and thrown only outside the building. No recorded music is permitted. A grand piano is located in the Foyer of Meditation. Consult Ms.Ross or the designated representative about live music. The schedule for delivery, placement, and removal of flowers and other decorations must be reported to Ms. Ross or the designated representative no later than two weeks prior to the wedding. No decorations are to be placed in the Cloister of the Clasped Hands. A kneeling bench may be used. We do not provide one. Unity sand may be used, and communion for the bride and groom is allowed. Tables or receptacles are your responsibility, along with any cleanup after the ceremony. Decorations are not to be attached with tacks, pins, tape, or nails to any of the furniture, walls, or woodwork in the building. No flowers may be placed on musical instruments or furnishings (except for the large table, with proper protection under the container). To avoid damage to the floor, flowers must be placed in water-tight containers. Do not use wet, potted plants. The table in the McLean Foyer of Meditation cannot be moved. Audio and Video Recording: Extension cords and their placement must be approved beforehand. The Library decorates for Christmas during the Thanksgiving holidays. Neither these decorations nor any that the University puts up at any other time may be moved, with the exception of the table decoration in the Foyer of Meditation. The Armstrong Browning Library is not liable for personal effects that are lost, stolen or damaged. Personal items must be removed from the Library as soon as the wedding ends. The building will be locked as soon as the participants have left for the reception. 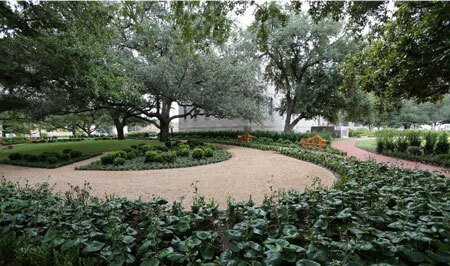 The beautiful Garden of Contentment outside the Armstrong Browning Library is an elegant setting for weddings. We wish to assist you in making your special event as lovely as its surroundings. In return, we ask that you help protect the garden, the building, and its surrounding grounds. Please follow closely. It is the responsibility of the signatory of the Wedding Application Form to ensure that the wedding party abides by the following requirements. *This designation requires a donation of $10,000 or more. Contact David Cortes, Library Development, to make a Library Patron donation. Return the Wedding Application Form within 10 days from date received and pay the Wedding Fee ($500.00), in full. Only one garden wedding can be scheduled during any month and only on a Saturday afternoon no earlier than 2:00 pm. and no later than 5:00 p.m.
After your date has been confirmed, a meeting and walk-through must be scheduled with Ms. Ross or a designated library representative to discuss the possibilities and limitations of a garden wedding. A family member and/or wedding consultant is welcome to attend the meeting. SPECIAL NOTE: In case of inclement weather, a plan must be in place for the wedding to be held at another location. IMPORTANT: Two weeks prior to the wedding, the bride-elect and/or the wedding consultant must contact Ms. Ross or the designated representative to discuss final arrangements and schedules. After this time, extensive and time consuming changes will not be considered. The wedding fee is $500 for the rental of the garden without building access. On Saturdays, the building is open to visitors until 2:00 p.m. If building access is requested for the wedding party and use of restroom facilities, an additional fee of $300.00 will be charged for a maximum of 3 hours (first-floor access only). Rehearsals are scheduled no later than 6:00 p.m. on the Friday evening prior to the wedding and does not include building access. If first-floor restroom access is requested for the rehearsal, a $100.00 per hour fee will be charged after 5:00 p.m.
Service of a security guard during the wedding ceremony is recommended. Please pay all fees by check or cash, no credit/debit cards are accepted at this time. Make checks payable to the ABL Guardian Angel Fund. The bride and groom will receive complementary three-year memberships in the ABL Guardian Angels organization (the Library's friends' group). Damage to the Library grounds or existing teak garden furniture will result in post-billing to the signatory of the Wedding Application Form. Charges are made at the discretion of the Director. Cancellation: The wedding fee is non-refundable. 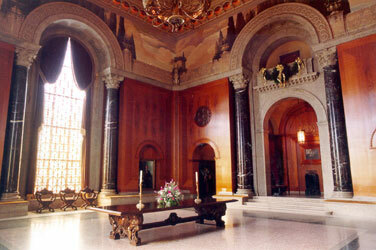 Wedding receptions are not held inside or outside the Armstrong Browning Library at any time. No open flame candles, including unity candles, are permitted, by order of the Fire Marshall. No alcoholic beverages or smoking is permitted on the grounds. Seating capacity for the Garden of Contentment is 300 people. Rental of chairs is the responsibility of the wedding party and must be acquired through a reputable company. Mrs. Ross will be happy to make recommendations. The schedule for delivery, placement, and removal of chairs, decorations, and equipment must be reported to Mrs. Ross or the designated representative no later than two weeks prior to the wedding. Please be sure that someone from the wedding party is present for any deliveries, set ups, or removals. The staff of the Armstrong Browning Library accepts no responsibility for these arrangements. Unity sand may be used, and communion for the bride and groom is allowed. Tables or receptacles are the responsibility of the wedding party, along with any cleanup after the ceremony. Placement of equipment and extension cords for the audio and video recording of the ceremony must be approved beforehand. Building access is not included in the $500 wedding fee. Additional fees are required for first-floor access during the rehearsal and on the day of the wedding. The Armstrong Browning Library may not be held liable for personal effects that are lost, stolen, or damaged. Personal items must be removed from the garden and Library as soon as the wedding ends. If building access was arranged, doors will be locked thirty minutes after the close of the ceremony.